Students at San Francisco Cooking School have revelatory moments all the time: filleting a fish, whipping cream by hand, carving a roast chicken or baking a pie. As someone who has taught cooking for many years, I see the eyes of new cooks light up when they master a technique for the first time. It might surprise you to know that one of the things that gets people most excited is making a homemade vinaigrette. Comparing vinaigrette freshly made from your pantry versus the bottled junk from a supermarket aisle is like comparing La Taqueria to Taco Bell. Have you read the ingredients on store-bought salad dressing? It isn’t pretty. 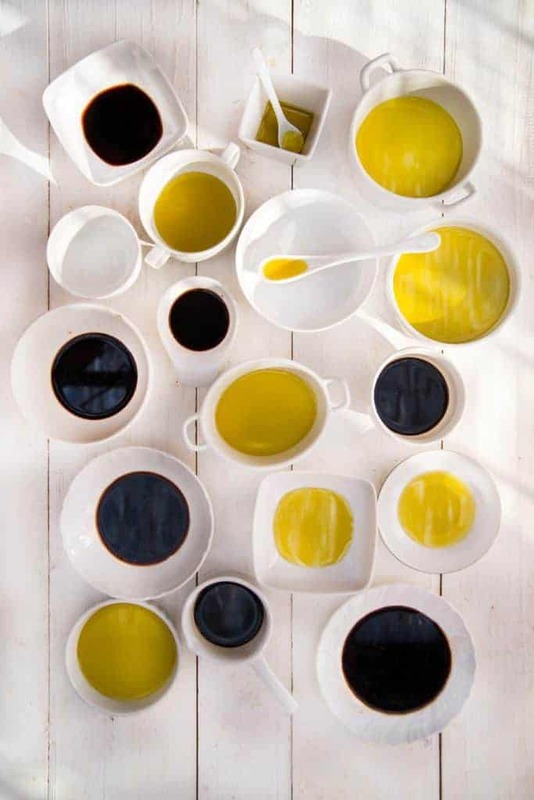 You know that gorgeous olive oil you smuggled home from Italy in your carry-on? Bring it on—vinaigrette is the perfect way to use it. Oil is really the star of the show here so you want to use one you love. My go-to is olive oil because I think of it as a flavor element, but if you’re making vinaigrette where a more neutral-flavored oil is in order, try grape seed, rice bran or a good-quality vegetable oil. Acid is the other piece. Vinegar is typically used (it is called “vinaigrette” for a reason) but fresh citrus juice works well too. You have tons of flexibility here. Every pantry should stock a good white wine vinegar, red wine vinegar and sherry vinegar and any of these is perfect in your basic vinaigrette. Balsamic works too but I personally like to cut it with a bit of sherry or red wine vinegar or I find it gets too sweet. Any cook worth their salt learned at some point that vinaigrette is typically 3 parts oil to 1 part vinegar. Start here, taste and adjust. It can depend on what you’re dressing, or just your personal preference. More acid will give it a stronger punch—great with richer foods like cheese or steak. To put it together I prefer using a jar with a tight lid. Start with the vinegar and add a good pinch of salt. Salt doesn’t dissolve in oil so it is important to add it here and not later. If you like, a minced shallot will add another layer of flavor, and adding it to the vinegar will eliminate some of the harsh raw onion flavor. Next comes the oil, the lid and a vigorous shake. What you’re doing here is creating an emulsion—the combination of two ingredients that don’t typically like each other are combined in such a way that they play well together. Shaking vigorously will do this, but you can also whisk the vinegar in very slowly. Vinaigrette is an “unstable” emulsion, meaning the oil and vinegar won’t stay together for long. So, if you are making it to use later, just shake or whisk it again before using. One addition that helps the emulsion stay together a bit longer, and tastes great, is a bit of Dijon mustard. Add ½ to 1 teaspoon to the vinegar and it’ll give your final vinaigrette a creamier consistency, plus it keeps it from separating so quickly. Tasting your vinaigrette is key. If you’re using it on salad you should dip a leaf of your greens into the emulsified vinaigrette to see what you think. Too acidic? Before adding more oil try another pinch of salt. Salt cuts acid and it is usually the culprit here. Too oily? A bit more vinegar, a dash of Dijon or a squeeze of lemon will fix that. This is improvisational cooking at its best. Vinaigrette is the ideal place to go “off recipe” and play with lots of variations. I’ve been known to add crumbled Gorgonzola, a spoonful of crème fraiche, chopped fresh herbs, minced garlic and smashed anchovies to mine. Think about how you’ll use it and let your palate guide you. Basic vinaigrette keeps for a week in your refrigerator (let it come to room temp before you use it). If you’re adding cheese, herbs or stronger flavors like anchovy and garlic, they’re best added just before you use it. Oh, and if I see you in the supermarket aisle buying store-bought “dressing” anytime soon, watch out!